On display from April 4 – April 28 in the galleries at Elberson Fine Arts Center, Smith’s collection includes a wide variety of media, working in paint, printmaking and richly textured mixed media. Her pieces are bold, colorful, and thought provoking. Smith’s work tells a story, deeply influenced by her history and personal ties to Native American tribes, human rights, and environmental issues. 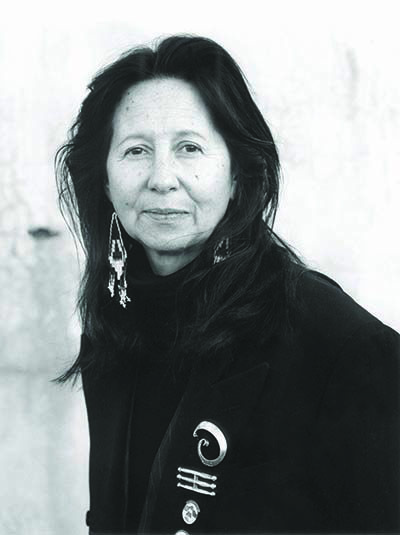 On Thursday, April 10, at 7:30 p.m., Smith will speak in Hanes Auditorium about her artistic style as it relates to her Native American identity, along with a discussion of Native American art and artists of today. She will also share her own creative process in painting, printmaking, public art and social practice. This event is free and open to the public, and will be followed by a reception. Jaune Quick-To-See Smith was born on the Confederated Salish and Kootenai Reservation in Montana, where she is an enrolled Salish member. Smith developed a love of art at a young age and knew that she wanted to pursue a degree in art once she completed high school. She recalls a comment from her art professor: “At the end of the year, the professor called me into his office and said, ‘You can draw better than the men, but I have to tell you, you need to go into another field. You’ll never be able to be an artist. Women are not artists.’” Smith’s incredible career, spanning over 30 years, proves quite the contrary. Smith’s work is held in collections of the Metropolitan Museum, N.Y.; the Whitney Museum, N.Y.; MOMA, N.Y.; and the Victoria and Albert Museum, London. She has received four honorary doctorate degrees, received the Joan Mitchell Foundation Painters Grant, a Lifetime Achievement Award from the Women’s Caucus for the Arts, the College Art Association’s Committee on Women in the Arts Award; New Mexico Governor’s Award in the Arts; New Mexico Women’s Hall of Fame, among other honors. She has had more than 80 solo exhibits over the past 30 years and has lectured at nearly 200 universities, museums, and conferences. Jaune Quick-To-See Smith’s exhibit will be open to the public, free of charge. Gallery hours are 8:30 a.m. – 5:00 p.m., Monday – Friday; 1:00 – 5:00 p.m., Saturday and Sunday.